Malaria, a disease endemic in South Sudan with the entire population at risk, continues to be the leading cause of morbidity and mortality, accounting for 59% of cases and over 28% of deaths reported in health facilities in 2018. Children under five years and pregnant mothers are the most vulnerable. As part of efforts to prevent and control the disease, the Ministry of Health with support from the World Health Organization (WHO) and the United States Agency for International Development (USAID) is enhancing malaria surveillance through strengthening a network of selected sentinel sites countrywide. The sentinel sites will be strengthened to become centers of excellence in malaria surveillance and case management to provide the much-needed quality data for decision making and timely response. This tailored comprehensive package of support was embarked on with a training of 23 state malaria coordinators, state malaria monitoring and evaluation (M&E) officers and national malaria control programme staff aimed at improving their skills in malaria surveillance, M&E including malaria epidemic preparedness and response. "Despite the prevailing access challenges in some parts of the country, Malaria prevention and control remains a priority program highlighted in the Health Sector Strategic Plan 2017-2022 and the National Malaria strategic plan 2014-2021" said Dr Harriet Pasquale, the country's Malaria Program Director at the Ministry of Health. She underscored the concerted efforts to fight malaria by the government, WHO and other partners through implementation of an integrated package of cost effective interventions. Malaria surveillance in South Sudan is integrated into the broader Health Management Information Systems (HMIS) in which entry, transmission and storage of routine health data is through the widely adopted electronic District Health Information system (DHIS). Malaria is also part of the notifiable diseases in the country's Integrated Disease Surveillance and Response (IDSR) and WHO Health Emergencies' electronic based Early Warning and Response System (EWARS). A key guiding principle in this support will be to strengthen surveillance while in alignment with the existing systems as well as leveraging on current partner support to avoid duplication. Malaria prevention and control calls for a multi sectoral approach with a strong community engagement component, said Mr Evans Liyosi, Acting WHO Representative for South Sudan. 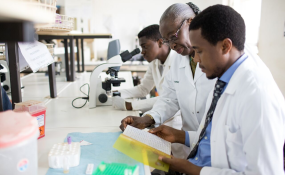 He reaffirmed WHO's commitment to support the country to strengthen malaria surveillance, in-line with the Global Technical Strategy for Malaria 2016-2030, Pillar 3 which calls for the transformation of malaria surveillance into a core intervention.